Long Hair individual extraction/ FUE elevates hair transplants to a new level! A ground-breaking and highly technical extraction instrument allows the currently gentlest and mildest single-hair FUE extraction, without patients having to worry about the need to shave at the back of the head, which would compromise their ability to participate in social events for a few weeks. When using the Long Hair Method, the hairs are extracted at the back of head without previously being shortened. Our customers are therefore immediately ready for social gatherings and may wear their usual haircut and length. 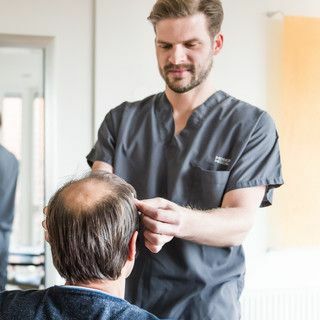 Through the Long Hair FUE Method, Moser Medical customers can exclusively enjoy the ability to participate in social events as fast possible – the usual shaving at the back of the head is not necessary. Products developed through Moser Medical’s research and development strengthen hair roots and are advantageous for hair growth. A globally unique device for hair extraction – can perform rotating, oscillating and vibrating movements at the same time. These techniques can be used as needed – either individually or combined in any order to enable a faster and milder treatment. A specially developed revolutionary Trumpet (attachment) now also allows us to perform individual extractions (FUE) with hair that is not shortened or shaved. Through a special extension and the combination of rotation, oscillation and vibration, all of the hairs can be extracted undamaged and in a gentle manner. They are transplanted onto the bald spot at their original length. The non-existence of any kind of shave allows our customers to attend social gatherings as fast as possible – without others being able to discern any visible signs of the extraction (e.g. shave at the back of the head, suture etc.). 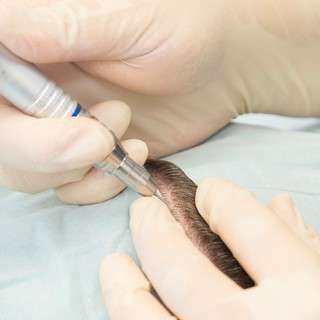 Just as in the case of the two other extraction techniques (FUE & FUT), the transplanted hairs are usually lost after a few weeks. At this point, the hair root goes into a so-called resting state until forming strong new hair about three months later. Prior to the hair loss treatment, there is a detailed conversation with your doctor, during which your hairline is marked together. Throughout the entire day of your treatment, your personal medical assistant will accompany you and will take care of your wellbeing. The duration of the extraction is fundamentally contingent upon the size of the FUE hair transplant (FUs needed) - normally the procedure takes between one and three hours. In contrast to the usual FUE extraction technique, in the case of the Long Hair FUE Technique and thanks to the use of a highly modern Trumpet, no shaving at the back of the head is required anymore. The follicular units (FUs) that are to be transplanted are extracted from the fringe of hair (=donor area). At Moser Medical, the long hair extraction is performed using a newly developed high-tech instrument with an oscillation, rotation and vibration function. It is also equipped with a customised extraction extension. A specifically tailored cut and movement mechanism allow for a mild and gentle extraction of all the hair, without having to previously shave it. In the case of the FUE extraction, the follicular units are removed individually from the scalp in full length, in groups of one to three hairs. Due to the complex and precise removal of the individual long hair roots, the procedure takes several hours and requires more time for the extraction than the regular FUE technique. Due to our physicians’ experience, our utmost diligence in the extraction process and a local anaesthetic, you do not feel anything throughout the entire process. 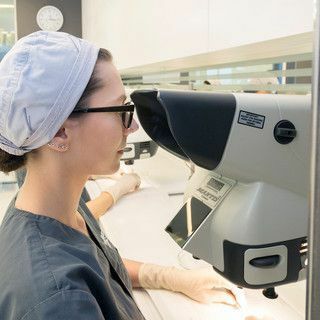 Our assistance team, composed of up to 15 specialists for each treatment, prepares the follicular units (FUs) under high-resolution microscopes for the ensuing hair transplant. From the moment of extraction until the moment of transplantation, the FUs are stored in the so-called Storage Solution, a special nutrient solution developed by Moser Medical. In the final stage of the treatment, the prepared FUs are transplanted onto the previously defined bald or balding spots. Our experienced surgeons take the direction of growth into account in order to create a natural hair appearance. Thanks to our very fine precision instruments, we already take the direction of hair growth, hair structure and possible hair whorls into account at the time of implantation and can achieve an exceptionally high density. Patients benefit from our utmost diligence and decades of know-how of the entire medical team. You may sleep, listen to your favourite music on an iPod or have a conversation with our medical team. You can, at any time, consume snacks or drinks or go to the bathroom. 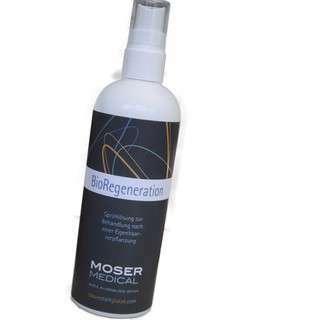 In the end, BioRegeneration, an important medical product developed by Moser Medical’s own research laboratory, is sprayed on. It furthers hair growth, strengthens hair roots and accelerates the healing process. Patients can go home/back to their hotel with their companion/by taxi on the same day after the end of the hair transplant. Due to the non-existent shaving you are immediately ready to participate in social activities. In the coming weeks, the hairs are in a resting phase. After a little more than a month, sports and exhausting activities are possible again without any limits. Approximately four to six months after the hair transplant, the roots start to gradually develop new hairs. During this phase, the patient can observe progress on the way to the final result on an almost daily basis. The end result is visible after 8-12 months: at this point strong new hair has grown permanently on the formerly bald or balding spots.